Farewell Ted (207/365 v2.0) – Annoyingly Boring? Unplanned, but we caught a glimpse of the procession bringing Senator Kennedy’s body from Cape Cod to the JFK Presidential Library Thursday afternoon. 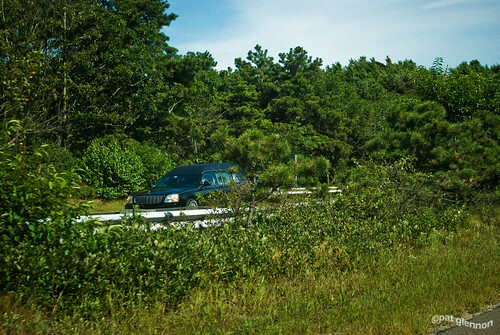 We had decided to spend the day on the cape and as we were driving east on Route 6 we noticed there were loads of people lining the sides of the road. Sure enough they were waiting to pay their respects. Soon enough the procession passed westbound. We didn’t pull over so the only shot I got was through the windshield doing 40 MPH or so as the hearse was doing about the same in the other direction. We had a blast on the cape, mostly in Hyannis and Yarmouth. Squeezing every last bit out of this last week of school vacation (Many more photos yet to process). Wow! Great unexpected cap, PG! .-= Maureen´s last blog ..The Price Of Apathy =-.